The Bunny Hop is a 1950s novelty dance invented by the students of Balboa High School in San Francisco in the spring of 1952. 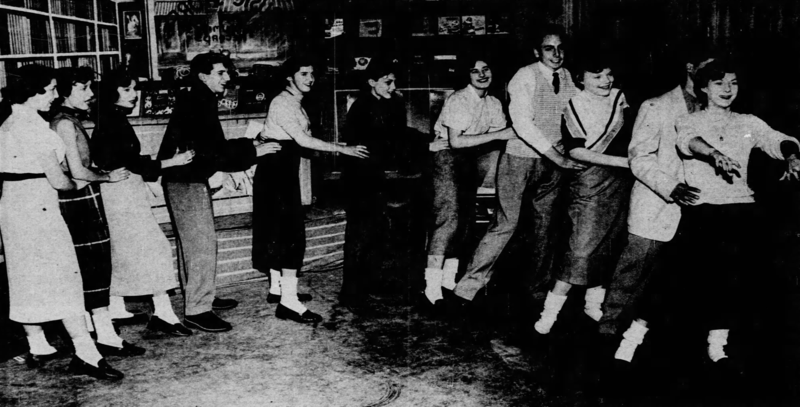 Upon hearing of the dance, bandleader Ray Anthony wrote a tune to accompany it, and a timeless dance craze was born [TM53]. A decade later, the Bunny Hop was revived in the form of the Finnish Letkiss. Point right toe out to side twice (1, 2), point left toe out to side twice (3, 4). Then jump straight forward with both feet (5), jump back with both feet (6), and jump forward with both feet three times (7, and, 8) [NS52, PI53, RA53, CR55]. A more exuberant version replaces the toe points with kicks [RA53, LW57]. The Bunny Hop is danced in a single file line, with your hands on the waist of the dancer in front of you [NS52, PI53, CR55, LW57]. NS52 — Nancy Sheppeard. (1952, November 2). "Bunny Comes Back to High School Crowd." The Salina Journal (Salina, KS). PI53 — The Philadelphia Inquirer (pub.). (1953, March 1). "The Bunny Hop." The Philadelphia Inquirer (Philadelphia, PN). RA53 — Ray Anthony. (c. 1953). The Ray Anthony Show [TV Show Episode]. United States. TM53 — Time Magazine (pub.). (1953, January 26). "New Pop Records." Time Magazine. New York. CR55 — Capitol Records (pub.). (c. 1955). The Bunny Hop [Instructions on Back of Record Sleeve]. United States. LW57 — Lawrence Welk. (c. 1957). The Lawrence Welk Show [TV Show Episode]. United States.